DOE, METI, the State of Hawaii and the Prefecture of Okinawa signed a Memorandum of Cooperation (MOC) featuring the Hawai’i-Okinawa Partnership on Clean and Efficient Energy Development and Deployment on June 17, 2010 in Tokyo. *1 The partnership was continued for a further five years in 2015. Under the partnership, there have been regular meetings between organizations in Hawai’i and Okinawa concerning various aspects of clean energy. From this partnership, has also grown the sister city relationship between Hawai’i County and Kumejima Town. This page will serve as an informational tool for interested parties seeking information on upcoming events and news concerning Kumejima and Kona. While we will strive to make this page as accurate as possible, information posted here is not provided by Okinawa Prefecture or relevant public institution officials. Schedule: The list of speakers, attendees, and other information has yet to be published. Please check the event hopepopage for more information as it becomes available. 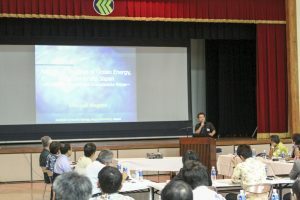 The next Ocean Energy and Economic Development Symposium and Workshop will be the nineth yearly meeting between stakeholders in ocean energy fields between Hawai’i and Okinawa. Date: September 28, 2018 6:00pm. Schedule: This event will celebrate the 7th year of the Kumejima Town- Hawai’i County Sister City relationship. We look forward to re-affirming the ties between both locations that have grown so close over the past five years. 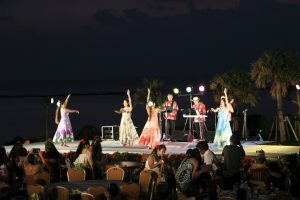 This year’s event is taking place during the annual Kumejima Hawai’ian Festival, and in order to increase cultural exchange, Kumejima Town will be combining the Anniversary Ceremony with this fun yearly event. Although not an event in itself, the yearly exchange of high school students between Konewaena High School and Kumejima High School has become one of the major highlights of closer cooperation between the two sister city participants. This year’s student schedule is still under development, but we look forward to their participation in related events if possible. This exchange is a unique opportunity for students to learn about other cultures and languages, and also get more information on the renewable energy work being done at both locations in developing Ocean Thermal Energy Conversion (OTEC) systems. Places:Okinawa Cellular Stadium Naha, Okinawa Convention Center, Okinawa Prefectural Budokan Arena, Onoyama Comprehensive Athletic Park, Jichikaikan, Naha Civic Hall and others. 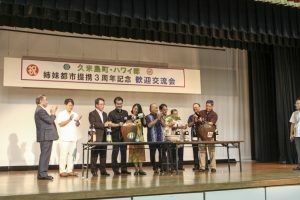 Every five years, Okinawa prefecture hosts a worldwide Okinawan Reunion to invite Uchinanchu back to the Okinawa mainland. For more information, see the English page here. *October 26 is the pre-festival preparatory event. 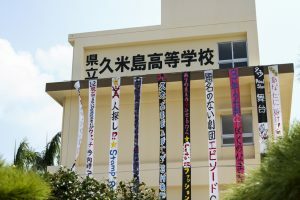 This year, in conjunction with the World Uchinanchu Festival, Kume Island will be welcoming back people with roots in Okinawa from around the world. It is our hope that many will take this unique opportunity to visit Kumejima and see what has changed (and what is still the same). It should be a fun opportunity to reconnect with the culture and history on this small island while also enjoying the wider Uchinanchu Festival. If you’re from Kumejima please contact https://www.facebook.com/worldkume/ or email world-kume [@] town.kumejima.okinawa.jp. There will also be a ceremony sponsored by Kumejima Town at the Gushikawa Community Center, we’ll update this page with more information as it becomes available.